You can’t blame Tony Ridder for shedding a tear as his semi-eponymous company formalized its forced sale to McClatchy Newspapers. The liquidation of Knight Ridder represents not only the end of a once-proud publishing company but also the passing of life-as-most-of-us-would-have-liked-it-to-remain for the newspaper business. Or does it? 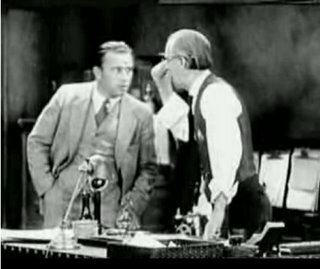 Availing myself the other night of the free, full-length, movie “Big News” at Google Video, I marveled at how far technology has come since 1929, when the talkie was filmed in an appropriately seedy simulated newsroom filled with clacking prehistoric typewriters. Minus the politically incorrect Polack crack, Armstrong’s rant would be quite at home in any newsroom today. Needless to say, our hero bags a big scoop, regains his job and reclaims the affection of his significant other. Let's hope today's newsfolk will continue to do as well. Robert Armstrong (left) jousts with editor played by Charles Sellon in "Big News." Is S.F. Chron next on Dean's list?